Hi! I hope everyone’s having a great week! I love this meme – it’s so true these days – health insurance has become even more complicated recently and there’s still many people out there that aren’t entirely sure how each part of their plan works – especially when employers have to raise the deductible really high, implement plans with network or visit limits, or switch to an H S A just to offset huge renewal increases. For many employers, simply switching to this higher deductible is where the conversation ends at renewal time – the deductible goes up, premium goes down, and then the prayers for a single digit increase next year begin. Well, that’s one way to do it……..
What if I told you there were several different ways to offer health benefits to your employees – you don’t just have to pick a plan and be stuck with it – there’s no “One Size Fits All” when it comes to Health Insurance – let’s get creative! I’ll explain these methods in more detail in future blog posts, but here’s a quick run down of the best ways to offer health insurance to your employees while keeping premiums low and offering great benefits! So simple – most small business only offer one plan to their employees – some employees can afford to pay more for coverage, some can’t – some employees need better levels of coverage, some don’t. Offer a “Core” plan, set your contribution amount off of that plan and let the employees “Buy-Up” to other plans if they need better coverage. Uses the same concept as the HRA listed above, except you pay a separate insurance carrier to take on that potential deductible risk – VERY cost effective method!!!!! 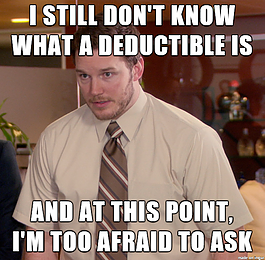 Most of the time, we end up offering people a very low deductible, which the employees love! NOT your typical GAP plan! Using the same HRA concept, the Beazley product sits on top of your high deductible plan and pays for Inpatient and Outpatient surgeries among other covered services that apply to your deductible. This product pays first and in many cases, we set employees up with a very low inpatient deductible!!! The 4 above mentioned strategies are fantastic ways to lower your premiums and offer great plans to your employees, but this method is actually another way to offer medical insurance itself. Want to see your monthly claims? Want to be rated based off of how your company’s claims are running? Want to get money back at the end of the year if you didn’t use the insurance much this year? NO PROBLEM! These are actually some of the great features of Level Funding – the great news is, you can apply all of the methods listed above to a level funded plan! Thanks for reading!!! Have a great week and GO BUCKS!!! Beazley Gap Insurance – HUGE benefit increase + $$$ Savings!! Insurance for your Group Insurance plan = Big $$$ Savings!! HRA’s – Save Premium and Offer a great plan! Health Insurance Multi-Option Plans…giving your employees a choice!